Thou shalt humble thyself to thy superiors, or thou shalt suffer their wrath. 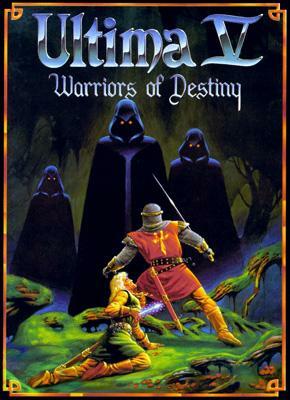 Ultima V: Warriors of Destiny is an 1988 video game. Things start getting Darker and Edgier. Since the the Avatar's success in Ultima IV, Britannia has been busy. It's created a new system of government to act next to Lord British, the towns and city-states are starting something of a renaissance in ship-building, farming, road-building, and even lighthouses. And while they're at it, the Government decides to do something about those pesky Dungeons. They seal them up with magic words so that nothing can enter or leave. While they're at it, let's raise the Codex out of the Abyss so that people don't have to go through that dungeon filled with Gargoyles Daemons in order to get the virtue. This was, perhaps, the start of the problem. Lifting the Codex out of the Abyss left a huge... hole where the Abyss used to be (don't overthink it). This "Underworld" was filled with beasts far worse. This lead to the decision to finally put Lord British's invincibility to good use and have him lead an expedition to check this out. The party he is in is attacked by 3 spectres clad in Black Cloaks called the Shadowlords, and even Lord British vanishes. In the wake of his disappearance, the Regent Blackthorn takes tyrannical control of the government that had been given so much power, and through him, his forces, and the Shadowlords themselves reign supreme in Britannia. ....where did this Darkness come from? And where is Lord British? It's time for the Heroes of Olde to assemble again. It's time for the Warriors of Destiny. Darker and Edgier: The Britannia you enter in this game is not the Britannia you saw in the previous one. Lord British is nowhere to be found, you and your old companions are branded as outlaws, and the virtues you represent as the Avatar have been turned into oppressive laws. When you are captured by Blackthorn, he'll ask you one of the eight mantras and will use that to destroy the corresponding shrine. However, you as the Avatar can restore them, and there is one shrine that can never be destroyed because it lies in the Ethereal Void. This is, of course, done to prevent the game from becoming Unwinnable if you happened to tell a mantra to the wrong person. If you type a swear word during a conversation with an NPC, you will get this response: "With language like this, how didst thou become an Avatar?" Evil Pays Better: Averted, The reward you get for betraying La Résistance is basically useless. Evil Weapon: Behind lots of magically locked doors in Blackthorn's castle you find a weapon called Chaos Sword. Trying to wield it in battle causes you to lose control of the character who will then happily attack all other party members with the immensely powerful sword, and falls unconscious when there is nothing left to fight. Fan Remake: Ultima V: Lazarus, a mod for Dungeon Siege. It's pretty good, and features expanded dialogue, quests, and an alternate main quest for evil-minded Avatars who would prefer to join the Oppression and the Shadowlords. Fighting a Shadow: Even if you kill a Shadowlord in combat, they'll just reform instantly. Guide Dang It: None of the NPCs who give you information guiding your quest mention the sandalwood box, an absolutely vital item to completing the game, and the (unintuitive) steps to finding it are alluded to rather than being clearly explained. Worse yet, by the time you find out you need it, it's completely impossible to retrace your steps. Hide Your Children: Entirely and horribly averted. Children are shown A) enslaved to extort information from their parents B) subjected to brutal punishment along with their parents C) in hiding and starving because their parents are unjustly imprisoned. In one of the rooms of the Dungeon Hythloth, a roomful of hostile children inexplicably attacks the player's party, who must either flee or kill them (in Ultima V: Lazarus, you hear the children laughing as you arrive and screaming as you kill them). Worse than that, try infiltrating Blackthorn's castle and talking to his chef about what's cooking: "A little ol' horse meat, a few young children, that sort of thing." Knight Templar: Lord Blackthorn, who turns the virtues into laws, with harsh penalties for breaking them. For example, if somebody is not charitable, they will be thrown into poverty. La Résistance: Two of them, there are the titular Warriors of Destiny, composed of old companions of the Avatar, and a separate one in Yew that houses the Government in Exile. Magic Carpet: For Sequence Breaking fun, you can get it at the very beginning of the game by getting some skull keys from anywhere to open the magically locked door. Or just (p)ush a cannon in front of the door and blast it open. Nigh Invulnerability: You can't kill Blackthorn, he's just as Invincible as Lord British was (more so, even). The Shadowlords are equally unkillable in theory, although at least you could hurt them to the point that they would run away (if very lucky or using a glass sword, they'll vanish). This accomplishes very little, though, because they'll still be around (and back at full health) to challenge you again next turn. Obviously Evil: Oh sure Lord British, you can totally trust a man named Lord Blackthorn. Subverted, as Blackthorn actually was a kind and decent person, until the Shadowlords corrupted his mind. One-Hit Kill: The Glass Sword. You can only get one at a time (unless that one is equipped to a party member, then you can get another). One hit will kill anything except Blackthorn. Pun: "Gazers" a.k.a. Expy of Dungeons and Dragons "Beholders", release a cloud of insects when you kill them. In other words.... they're Bee Holders. Sdrawkcab Name: I know, let's invite Saduj to join the team. Good, trustworthy, Saduj. The game documentation includes a record of Lord British's journey into the underworld, written by a scribe named Remoh. Sealed Good in a Can: The Shadowlords have trapped Lord British in the deepest part of the world. Sequel Difficulty Spike: The party members' health has been reduced to 30% of what they had in the previous game, while enemies don't seem to be any weaker. Ultima V is considered one of the hardest games in the series for a reason. However, the newly introduced day/night cycle does help things a bit: monsters aren't too likely to be encountered during the day, so it is now actually possible to travel from town to town without having to fight hundreds of mooks along the way. Also, if your party wipes, you now lose experience and even levels. Soul Jar: The Shards of the Gem of Immortality are what bind the Shadowlords to this plane of existence. Speak of the Devil: You have to track down the true names, but naming a Shadowlord causes it to appear, which is bad but easy to run away from. Of course, you need to do this to complete the game. The Unfought: You are not ever required to enter into conventional combat with the Shadowlords or Blackthorn. In fact, it's much easier to just avoid them. As such, there is no "final battle", though there is a ritual for the Shadowlords; it does not involve combat. Unwinnable by Design: There is a hidden box that you can get early in the game, if you happen to know where it is. It's important. You can't open it, even with fireballs or the One-Hit Kill sword. It is needed to win the game; if you don't bring it to the endgame, you lose. Also, if you lie to Lord British and say you don't have it, you're stuck with the Idiot Ball for all eternity. Doubles with Guide Dang It because nobody in the game tells you what it's needed for (and it's the single most important item required to complete the game). Warped Aesop: Literally. Blackthorne has taken the Virtues and twisted them ever so slightly, then made them all harshly enforced by the law, creating a horrible police state. This page was last edited on 27 February 2019, at 14:34.